M T D O c t o b e r 2 0 1 8 36 2018 Modern Tire Dealer Top 25 Commercial Tire Dealers in the U.S. 16. Raben Tire Co. LLC, Evansville, Ind., Scott Cisney, CEO, www.rabentire.com 10/11 Michelin, BFGoodrich, Goodyear, Dunlop, Kelly, Continental, General, Yokohama, Pirelli, GT Radial 3 116 $103 38 17. Bob Sumerel Tire Co. Inc., Erlanger, Ky., Bob Sumerel, CEO, www.bobsumereltire.com 11/9 Bridgestone, Firestone, Continental, Goodyear, General, Yokohama, Cooper, Michelin, Toyo 6 91 $99 37 18. Ziegler Tire & Supply Co., Massillon, Ohio, Bill Ziegler, president, www.zieglertire.com 0/17 Michelin, BFGoodrich, Bridgestone, Firestone, Dayton, Continental, General, Uniroyal, Goodyear, Dunlop, Kelly, Advance, Constellation, Falken, Hercules, Samson, Sumitomo, Yokohama 2 80 $93 33 19. Commercial Tire Inc., Meridian, Idaho, Bob Schwenkfelder, CEO, www.commercialtire.com 10/29 Bridgestone, Firestone, Dayton, Yokohama, Roadmaster, General, Continental, RoadX 3 147 $86 61 20. Black's Tire Service Inc., Whiteville, N.C., Ricky Benton, president, www.blackstire.com 0/46 Goodyear, Dunlop, Kelly, Continental, Roadmaster, Double Coin, Hankook, Falken 1 120 $77 47 21. Sullivan Tire Co. Inc., Norwell, Mass., Robert Sullivan, president, www.sullivantire.com 15/1 Bridgestone, Firestone, Goodyear, Dunlop, Kelly, Double Coin, API 3 90 $75 34 22. Nebraskaland Tire Co. Inc., dba Nebraskaland Tire, Kansasland Tire and Coloradoland Tire, Lexington, Neb., Gary Wright, president, www.thetirestore.com 5/24 Goodyear, Dunlop, Kelly, Roadmaster, Aeolus 3 64 $70 47 23. Valley Tire Co. Inc., Charleroi, Pa., Jim Stankiewicz, president, www.valleytire.com 8/9 Michelin, BFGoodrich, Continental, General, Yokohama, Sumitomo, Uniroyal, Firestone 1 55 $68 31 24. Pete's Tire Barns Inc., Orange, Mass., Peter Gerry, CEO and president, www.petestire.com 0/19 Bridgestone, Firestone, Michelin, Continental, Double Coin, General 2 121 $65 29 25. Royal Tire Inc., St. Cloud, Minn., Mick Pickens, president, www.royaltire.com 12/3 Bridgestone, Firestone, Michelin, Toyo, Dayton 2 121 $49 29 Network update: In addition to independent tire dealers, com- mercial trucking services are available through company-owned networks and truck stop chains. Among these are Continental Tire the Americas LLC, which has expanded its Best Drive LLC network by five outlets (Denver, Colo.; Dallas, Texas; San Antonio, Texas, Marietta, Ga., and Los Angeles, Calif.) since October 2017. BestDrive currently has 26 locations in 15 states. 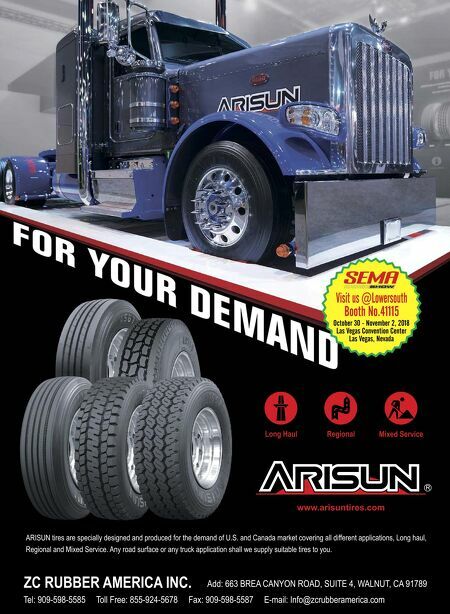 Here is an update on other sources of commercial trucking services: Goodyear Tire & Rubber Co.: About 200 Goodyear Commercial Tire & Service Centers in the U.S. Bridgestone Americas Inc.: 156 GCR Tires & Service locations in the U.S. Michelin North America Inc.: 6 Tire Centers LLC (TCi) locations in the U.S. Pilot Travel Centers LLC's Pilot Flying J Truck Care network: 750 locations in 43 states and Canada. Love's Travel Stops & Country Stores: 52 Speedco locations and more than 250 Truck Tire Care centers in the U.S. TravelCenters of America LLC: 244 TA Truck Service Commercial Tire Network locations in the U.S. How the rankings are determined: To be ranked on the MTD Top 25 U.S. Commercial Tire Dealers list, a dealer has to: 1) sell truck tires, 2) have at least one retreading plant, and 3) offer 24/7 road service. Points are tabulated based on number of outlets. Each commercial- only outlet receives two points and each retread plant receives one point. The number of combination commercial/retail stores is multiplied by the estimated percentage of commercial sales and then multiplied by two. The highest 25 point totals make up the list, and then the dealers are ranked based on estimated commercial sales. 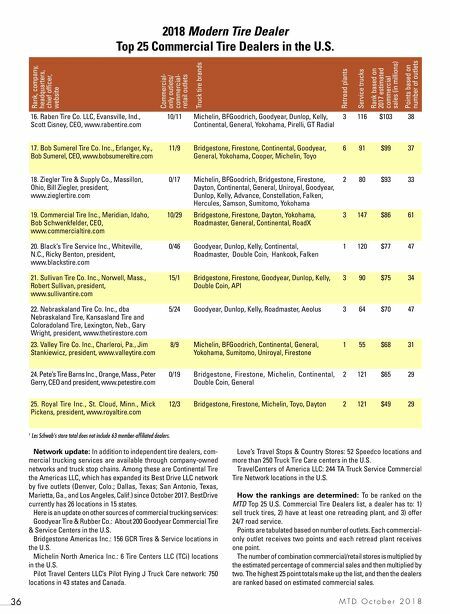 Rank, company, headquarters, chief officer, website Commercial- only outlets/ commercial- retail outlets Truck tire brands Retread plants Service trucks Rank based on 2017 estimated commercial sales (in millions) Points based on number of outlets 1 Les Schwab's store total does not include 63 member-affiliated dealers.